You know I’m interested in natural dyeing and that my favourite textile palette is “neutrals”, much to the distress of relatives who love brighter colour! Well, today I had the chance to explore another form of “natural” dyeing. Mud Cloth, and ancient fabric patterning technique practised by women in the West African country of Mali. Tutor Judy Dominic of Ohio, USA, is in WA for WAFTA and this weekend is giving a sellout class in a modified version of the time-consuming practice. The class of WAFTA members (and other members who were not in the class but donated mud) contributed soil from as far north as Broome and the Pilbara, as far south as Walpole and as far east as Kalgoorlie. So we had blacks, greys, reds, oranges and yellows aplenty. 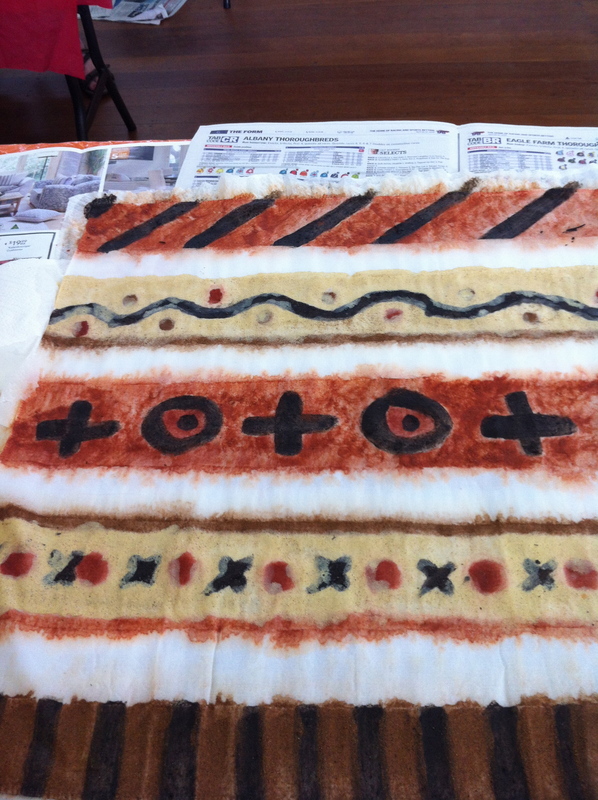 Judy showed us how to make pastes and paints and to add soy milk to help with attachment of the pigments to the fabric. Tomorrow we are going to paint the backs of our now dried samples with a retention agent (used by paper makers I understand) so we can wash them reasonably quickly. The purist alternative is to wait six months until the pigments have fully attached to the fibres. Too painful? As I said to Judy, I’d like to hold out and wait six months , eschewing the ‘unnatural’ intervention to speed things up. But wouldn’t that be hypocritical since I myself used a Thermomix to render my clay usable? Anyway, I’m enjoying the workshop very much. Here are some images of work in progress. The real test is when the fabric is washed out. If the pigments in the mud have not penetrated the fibres but are just sitting on the top of the fabric, then a very pale image indeed with result. It may be that the mud covered fabric is now looking as good as it will ever be! The inter-relationship between the Mud Cloth dyeing and patterning techniques of Malian women and the political upheaval in that country are every bit as fascinating as the cloth itself. Although I know we are not rendering our cloth in anything other than a superficial parody of the techniques developed since the 1200s in Mali, I sit think I’ll do this again. I envisage stitching on this and dyeing the background in a neutral, non-white colour. That’s if any of the pigments stay in after washing! I’ll add more images to this post after tomorrow…. You put clay in your thermomix!!!! Yes, I dd put clay in my Thermomix! Why have all that power and not use it? With its heavy duty stainless steel interior and powerful motor it creamed the clay just as it does cream cheese. And washed out perfectly! !